The In-Person Assister Program is designed to help educate and enroll uninsured and hard-to-reach residents and small businesses in health insurance plans. By offering multiple health insurance plans, employers and employees win! Just ask a broker for details! The District's Health Benefit Exchange will enable individuals and small employers to find affordable and easier-to-understand health insurance. Small businesses can determine their contribution and offer their employees the ability to choose from an array of policies. Special Enrollment events and much more. Open enrollment for individuals and families runs through January 31, 2019. Time is Running Out to Get Health Insurance Coverage Starting January 1st! 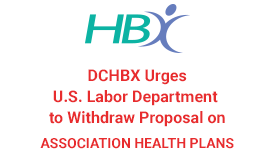 HBX is announcing the formation of a new working group, the ACA Advisory Working Group. What is the HBX Authority?